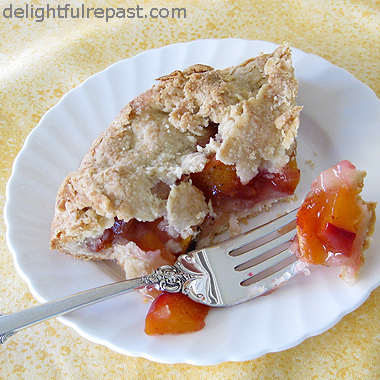 Homemade peach pie is my favorite summer dessert. But it serves eight, and most days I'm cooking for two. Leaving me with three choices: 1) Don't make a pie, 2) Make a pie and waste at least a fourth of it because it really doesn't keep for four days, or 3) Make a pie and eat it for breakfast, lunch and dinner "so it doesn't go to waste." Some of you--and you know who you are--know what I'm talking about; I'm not the only one who does that! The solution? Just make a little rustic tart (galette, if you prefer the French name; crostata, if you prefer the Italian). The rustic tart is quicker and easier than a pie or tart, so you really won't mind making one that just makes three or four servings. And my method of rolling out the pastry right on the baking sheet makes it a real no-muss-no-fuss project. Of course, you need a rimless baking sheet like this one, Calphalon Classic Bakeware 14-by-16-Inch Nonstick Large Insulated Cookie Sheet, to do that. What is your favorite summer fruit, and what do you like to do with it? 1 Place a piece of parchment paper on rimless baking sheet; sprinkle lightly with flour. Preheat oven to 400 degrees. 2 In medium bowl, combine flour, sugar, salt and baking powder. With fingers, work grated butter into flour mixture until it has the consistency of coarse meal with some pieces the size of small peas. 4 Turn dough out onto lightly floured parchment-lined baking sheet. Form it into a disk and roll out to a 12-inch circle about 1/8 inch thick. Don't worry about ragged edges; they'll add character. Place in refrigerator while preparing the peaches. 5 Peel peaches or not--I don't--and slice into a medium bowl. I slice them like this: Quarter peach, cut each quarter into 4 wedges, cut wedges in half. If this were a fancy tart, I would not cut the wedges in half; would arrange the lovely wedges in a nice pattern. But this is a rustic tart, so no need to "arrange" anything! 6 In a tiny bowl, combine 1 tablespoon of the sugar with the 1 tablespoon of flour; set aside. In another tiny bowl, combine remaining 3 tablespoons of sugar with the salt and spices; set aside. 7 Remove the pastry from the refrigerator. 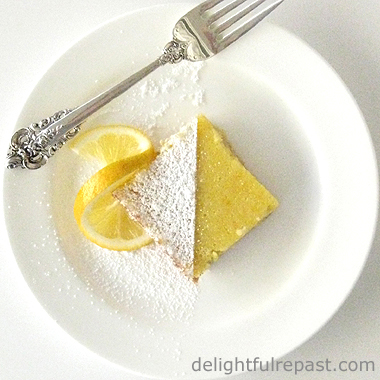 Sprinkle sugar-flour mixture evenly over the pastry, leaving a 2-inch border uncoated. Stir the sugar-spice mixture into the peaches and pour them into the center of the pastry, spreading them out, leaving a 2-inch border. 8 Bring that border up over the peaches a little at a time, sort of "pleating" as you go. Don't worry about making it look good. It will be rustic and beautiful. Bake for about 50 minutes or until the pastry is crisp and well browned and the fruit is bubbling. Thanks, Colette! And, of course, it can be made just as well with gluten-free pastry. Jean, You are so right! This is the perfect solution. So often I will not bake because with only two of us so much goes to waste. Pies are sliced into pieces? This I did not know. I thought they WERE one piece. Why corrupt a good round piece of pie with a knife? Why not just use a fork, as God intended? Eating instructions: eat until gone. One take. No leftovers. No problem. Actually, I'm looking for a recipe for a 12 inch pie rather than the puny 8 or 9 inch variety. Peach is good. Blueberry better. Black cherry and rhubarb (if it is aged properly in the fridge to get glurpy). And of course apple is great, especially if it's from an apple caramel tree. And – oh, oh, this time I've got it – LEMON MERINGUE PIE! Lemons are a fruit, right? Please say yes. Okay, okay, I'll make lemon meringue for a change, though I prefer real fruit pies! Soon. Mmmm, I love galettes but have only made them with apples. I'll have to try this recipe since peaches are in season and tastier than ever! I might have to sprinkle some wild blackberries in there too, just for fun. I liken galettes to a watercolor sketch, the gesture is there, but not the formality of a pie. Oh yes, do add some of those wonderful wild berries! And it's true, "the gesture is there, but not the formality of a pie." I like that! Okay, I'm sold! 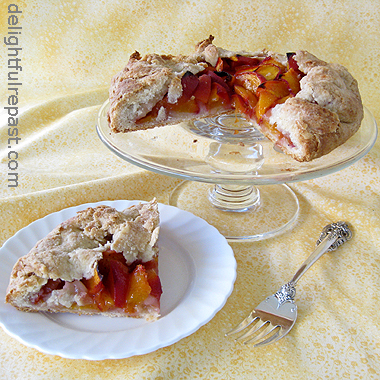 That looks delicious and I'm heading to the farmer's market next week to get peaches for my Peach Galette. I can hardly wait! This truly is a great idea because it's hard to have a whole pie (and my favorite kind, at that!) staring at me. Thanks, Judy! And are you going to leave the skin on like I do? I do it mainly for the added color (and, truth be told, the lessened work). I like to bake simple crostata too. Yours looks droolworthy, Jean. Thanks, Angie! I'd like to make another one today, but I'm down to just one large peach. Think I'll just slice it up, make a piece of toast, and call it breakfast. Oh wow! This looks absolutely divine! My gut brain wants some!!! We are definitely going to have to try this! But oh, I do have to agree with my good friend Sully... lemon meringue pie! Now that's my all time fave! Well, it looks like the time has come. With a second to Sully's vote, I'll have to post my lemon meringue pie soon. Thanks, Grant! Oh my gosh, peach galette, I love anything peach. Great recipe, going to have to give this one a try, now I am off to visit the potato salad post. Jen, thanks so much! Isn't peach just the greatest fruit ever! Thank you, Charles - especially about my having "that charming rustic look down"! Mmm, yes, raspberries are heavenly - nothing like homemade raspberry jam for my scones and Victoria sponge. But usually they're so expensive, I just eat them plain - very slowly, one by one. There you are, Jean--being the temptress. Of course local 49er peaches in season at this very moment are my favorite. Personally I like option #3--but-ahem--not very good for the figure. I love your Rustic Tart idea. But I confess I am too lazy to make a butter based crust. One made with olive oil is easier and still tasty (although not as tasty as butter-based crust). Sue, thank you! I must admit, I ate 3/4 of it and my skinny husband only got 1/4! If you want a super easy butter crust, look up my no-roll pie crust. Couldn't be any easier - anyone can whip it out in a hurry! My, this looks good! I've always wanted to make a galette, but haven't had the courage. You make it look so easy! Abby, thanks! You can definitely make this recipe - I have confidence in you! Thanks, Ruth. Don't worry about "falling behind" - *I* had a grilled cheese sandwich for dinner this evening! Thanks, Mary! And you can make it with any fruit that's handy.